The Illinois Green Economy Network, (IGEN) is hosting two Certification trainings, the CEA (Certified Energy Auditor) and the BEST (Building Energy Sustainability Technician) training in April and May 2013 at NO CHARGE, via a grant for IGEN. -If participant lives out of state, they must work for an Illinois based employer who buys electricity or gas from an Illinois utility. *If the participant wishes to take the CEA or BEST exam on the last day of the course, they will need to pay the $300 Certification fee and complete a separate application. Only the seminar portion is free for qualified attendees. *Class size is limited, so please register as soon as possible. Michigan Energy Fair is the largest & longest running event of its kind in Michigan and will take place in Ludington on June 7-8. Interested in learning more about solar, wind, energy efficiency, alternative fuel vehicles, saving $ on energy? Exhibits and workshops will provide the latest information on products, financial assistance, and programs that can help you. Friday, June 7 will be for businesses and energy and facility professionals and there will be a $25 charge to attend workshops. Saturday, June 8 will have exhibits and workshops for the general public and will be free. For more information, visit www.glrea.org. 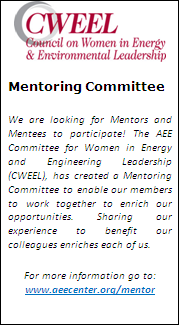 The meeting notes from the EMAEE Fall 2011 board meeting are now online. Washtenaw County has produced some green media focusing on initiatives that have helped to "green up" homes and businesses in Washtenaw County. Videos for homeowners and businesses alike can be found at their green media website. One of their videos has even been nominated for an Emmy! Check it out. Can you guess which state governor's mansion is the most energy efficient? Perhaps you would like to know the best way to lower your energy bills by using renewable energy? The answer to both of those questions and more can be found on a new Web site www.ChooseRenewables.com being launched by a Michigan company that promotes the use of clean and environmentally friendly energy sources. More info can be found in this Free Press article on the ChooseRenewables website. The Sisters, Servants of the Immaculate Heart of Mary have educated tens of thousands of students in Metro Detroit, and it might seem easy to conclude that the aging nuns in the order have accomplished most of the work they believe God intended for them. But life is long and the nuns say they believe it is all sacred. So they have set a new path, emphasizing the environment and scientific discoveries as part of their spirituality. A nationally acclaimed $56 million renovation of their huge motherhouse, which last week received another in a long list of awards from the Environmental Protection Agency, and a newly published booklet are but two examples of their unique fusion of faith, science and the human condition. For more information, refer to this Detroit News article on the Sisters. Bustling oilfield activity and retiring baby boomers, among other factors, have petroleum outfits large and small trying to hire thousands of engineers, and experts say the trend is expected to extend into the next decade as worldwide energy demand grows. Management consulting firm Oliver Wyman says roughly eight in 10 global oil and gas companies forecast a shortage of petroleum engineers through at least 2011. The American Petroleum Institute said U.S. energy companies will need at least another 5,000 engineers by decade's end. For more information, see this Free Press article on the energy engineer shortage. DTE Energy, Rolls-Royce and NextEnergy plan to announce later today the start of a three-pronged study of a new electricity delivery system that could signal a change in how consumers get their energy in the future. At a news conference, the trio will unveil the research project that tests solid-oxide fuel cells through Rolls-Royce's inverter technology at NextEnergy's microgrid located at 461 Burroughs in Detroit. For more information, refer to this Free Press article on the study's announcement. The Land Policy Institute at Michigan State University will host its first annual conference on wind power and its role in the state's energy portfolio. The conference entitled Manufacturing and Developing Wind Energy Systems in Michigan takes place Sept. 10-11 at the Kellogg Hotel & Conference Center on the campus of MSU in East Lansing. The two-day event will feature more than 200 alternative energy executives, experts and researchers discussing how Michigan can increase its profile in the $20 billion wind power industry. For more information, see this Free Press article or visit the conference's website. So you think you're an energy expert? As oil prices near record highs, U.S. energy major Chevron is inviting people to deal with a potential future energy supply crunch in an online game called Energyville, which uses real data and scenarios to power a city until 2030. Players in the free game, designed by The Economist Group, can choose from sources such as biomass, natural gas, nuclear and petroleum, with oil shale and hydrogen being added to the mix by 2015. Players can also invest in energy efficiency. The game can be accessed through the Web site, www.willyoujoinus.com -- an energy discussion forum and a slogan for a Chevron campaign advocating green energy and looking to recruit people. More info can be found in this Yahoo News article about the energy game. The Great Lakes Renewable Energy Association (GLREA) is hosting a one-day residential and small business solar energy program Sept. 15 in Oakland County. Cosponsored by Oakland University, the Go Solar Oakland Country event will feature alternative energy experts talking about ways to save money using solar power. The free event will take place in Gold Room C at the Oakland Center on the OU campus from 10 a.m. to 11:30 a.m.
For more information, see this Free Press article about the Go Solar Event. The RSS feed for the site was down & out for a little while, but the problem has been taken care of. Sorry for the inconvenience. More information regarding the upcoming April, 2007 EMAEE meeting will be coming soon. We hope to have an interesting speaker and lots of time to socialize and talk with one another. The RSS feed for EMAEE.org is now up and running. You can add it to any of your favorite news readers and keep up to date with everything happening with the EMAEE. We have been working on putting together an RSS feed for the site to keep you up to date on all of the latest happenings at the EMAEE. As soon is it is functional, we will let you know. Thanks. The layout of the front page of the site has a newly-added feature: the 5 most recent posts to the site. This will help everyone stay updated by letting you know when something has been added. Please let us know if this is useful by dropping us an email. The look and layout of EMAEE.org has been updated. Many hours were spent trying to make the site dynamic and very useable. Please let us know what you think by sending us your comments. Thanks. Hello. This is the first blog post on EMAEE.org's new page. Copyright © 2006-2008 East Michigan Association of Energy Engineers. All rights reserved.